We grill a LOT during the week. Sometimes I plan ahead, stop on the way home to get what I need and prepare everything with fresh ingredients. Other times, we just thaw something from the freezer and work with whatever we have around the house. Our freezer is full of protein bought on sale, so I'm always looking for ways to keep it simple for last minute meals from the freezer. This rub occupies a shaker container in the cupboard, always ready to go at a moment's notice. I even recommend doubling this recipe and making a decent batch, just so you have it next time. 1Combine all of the ingredients (except the tenderloin of course) in a clean coffee grinder and grind into a powder. 2Rinse the pork tenderloin with clean water and pat dry with paper towels. 3Rub the pork tenderloin with a generous amount of the rub and allow to sit for at least 30 minutes. For even better penetrating taste, let it sit a few hours in the refrigerator. 4Preheat the grill to medium-high heat. 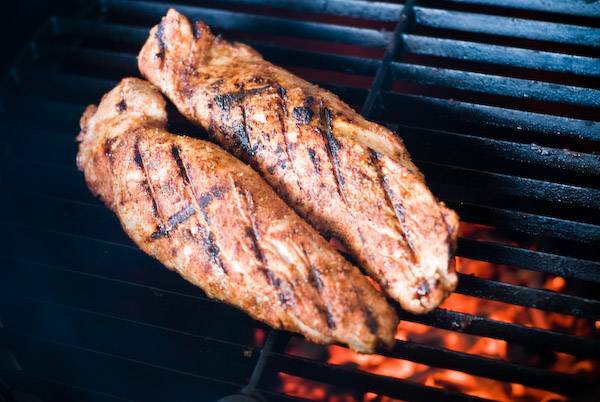 5Grill the pork tenderloin over medium-high with the lid closed until the internal temperature of the tenderloin reaches 140 degrees. Rotate the tenderloin every few minutes to grill all sides of the meat. 6All grills are different, but this should take around 15 minutes. 7Let rest for a few minutes, carve and serve!